A drive along Topanga Canyon Boulevard showcases the best of Los Angeles’ San Fernando Valley. The 20-mile highway offers hiking trails, scenic views, shopping malls, and diverse food options—connecting the ocean, mountains, and city. And in the middle of this stretch is the diverse neighborhood of Canoga Park, which is now the new home for The Salvation Army’s “valley miSsionAl communities” (VMC) led by Majors Rob and Stacy Birks. The Valley is packed with roughly 1.44 million people, but The Salvation Army has only one worship center in Van Nuys. Since July 2017, the Birkses have been working to bring the Army to the area through missional communities. 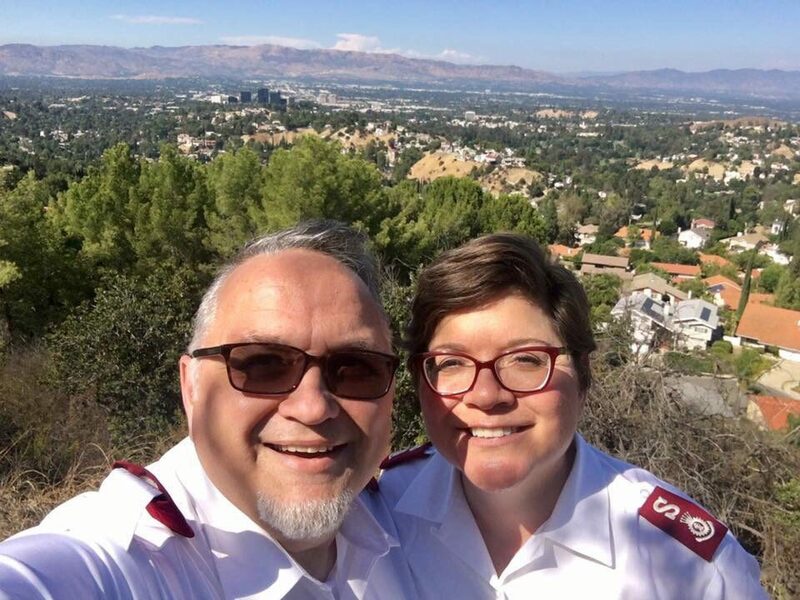 Majors Rob and Stacy Birks are working to bring The Salvation Army to Canoga Park, California, through local, missional communities. Stacy Birks noted that local law enforcement point to homelessness and gangs as the two largest issues in Canoga Park. The area is also prone to forms of human trafficking via massage parlors. So, on Tuesdays, she and a team hold “Sweet Prayer,” delivering homemade cookies and praying for women in massage parlors in the area. On Wednesdays, the Birkses lead a book club at the Army’s Family Store in Canoga Park, inviting shoppers to join. They begin Thursdays with a discipleship group and open the doors of their home Thursday evenings for prayer. On Sunday mornings, they worship at the Canoga Park Adult Rehabilitation Center, and again open their home in the afternoon for a meal and worship. The Birkses also enjoy driving up the road to the Topanga Canyon scenic overlook to pray over the entire valley below. Way to go Majors Rob and Stacy! So blessed to fellowship with you at your wonderful home church! Come one come all they have open hearts and home for sharing the love of Jesus!